Bali is world famous as a visitor destination with good reason! The island is a very special destination with a rich heritage and a strong culture. Located 8° south of the Equator, between Java to the west and Lombok to the east, Bali is known as ‘The Island of the Gods’. Bali was described as “The Morning of the World” by Nehru. Although Indonesia’s main religion is Islam, the Balinese are predominantly Hindu. In the eyes of the Balinese Hindu, existence is a continuous cycle of life, death and rebirth. The tapestry of life for the Balinese revolves around the many ceremonies associated with their family, village and major temples. Offerings made from palm leaf, flowers and foodstuffs are an art form associated with every ritual occasion in Bali. You will see daily offerings placed outside homes, offices and shops every morning and evening. The Balinese use two calendars (12 lunar months and 210 days) as the basis for determining the appropriate days for ceremonies and festivals. The significance of the above is that you will often encounter ceremonies while you are here in Bali – and if today is a good day to get married, you’ll see a lot of wedding ceremonies! Music and artistry play a big part in Balinese life. From shadow puppet theatre, to the village gamelan set, every Balinese grows up with dance and drama in their lives. Sculptures in wood and stone are seen everywhere as are basketry and painting. Bamboo, which grows so readily on the island, is used in architecture and furniture and to make domestic tools, musical instruments and many ritual objects. Rice Terraces in Bali. A landscape changed by generations of Balinese Farmers. Generations of Balinese farmers have changed the island’s landscape, clearing forests, digging irrigation channels, and terracing hillsides so that they can grow rice. 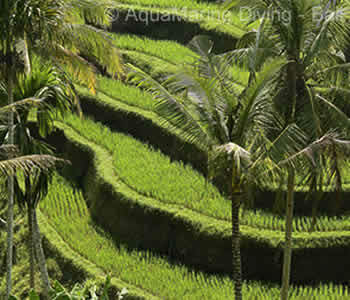 Bali is an island that has evolved and exists separately from the rest of the archipelago. Daily life as well as economical and political life is conducted very differently from other parts of the country. In Bali the rainy season (the north west monsoon) runs from December to March but varies yearly. The monsoon patterns, lunar calendar and seasonal upwelling of rich, cold water in the Lombok Strait (between Bali and Lombok) generally mean that April to June and September to November offer the best seasons for SCUBA diving. July-August and December-January are very good, while February-March usually have the least to offer due to the rain. While we do see Manta rays year round, the best seasons are April-May and then August to October – which is also the season for Mola-Mola (the huge Ocean sunfish). Please note these are only general guidelines. The Balinese take pleasure in their etiquette, and a smile is essential when speaking to the Balinese. When people go to a temple festival, they wear their best traditional dress and make themselves as beautiful as possible to please the gods. The Balinese believe the human body represents the cosmos, heavenly at the top, demonic at the bottom, with humanity in between. Their temple wardrobe, and the materials from which they are made, reflect this belief. You must wear a sarong and waist-sash upon entry to a temple. Flash photography and physical intrusions into ceremonies are unwelcome. The Balinese are very welcoming and hospitable and will do their best to help you to understand ceremonies. Please remember you are a visitor and that what you are watching is not a show put on for your entertainment, it is genuinely part of local people’s daily life. Try to use only your right hand, especially when handling food. Pointing and summonsing someone with your index finger is considered impolite. Also try not to point your feet at anyone. The Balinese are very understanding about the fact that you come from a different culture and will forgive you for most faux pas. When entering a government office, try not to wear sleeveless tops, shorts or a short skirt as this is considered disrespectful. In addition, although you are on holiday and enjoying the sunshine, please restrain yourself from going shopping in Speedos or a bikini.